A couple of days ago I received a little challenge from fellow blogger and avid surfer Splodz. Always game for a bit of fun, and when there’s a chance of winning something cool you can always count me in. Now, I very much doubt I’d even be close to winning anything like this with my mish mash of random photos but here’s my attempt…and in the meantime I get to share some of my most recent favourite images with you all! BLUE – There are many shades of blue – from that deep ocean blue you find out to sea that is so deep and dark that it almost swallows you up, through to the turquoise blues that can take you to a tropical paradise with jut a simple thought. Being an ocean lover and spending most of my life in the ocean and under the skies I get to see some fantastic blues. 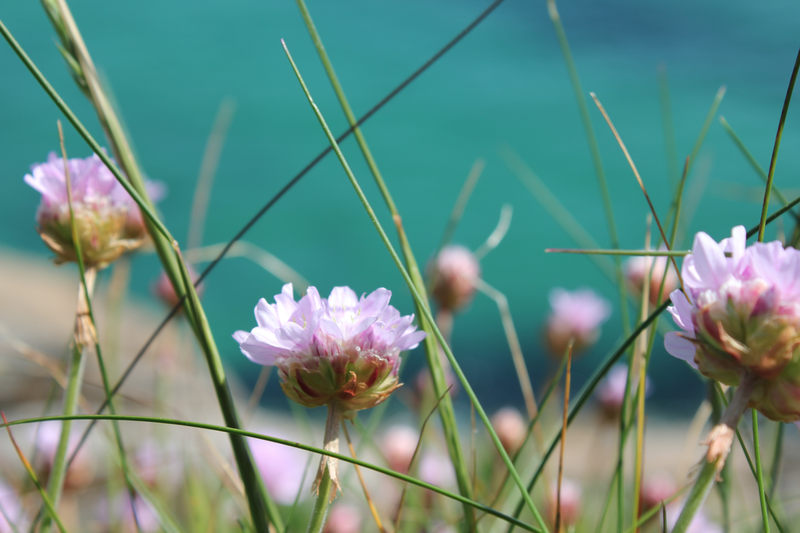 Here’s one of my favourite shades of blue, the rich turquoise that really makes this picture of some sea pinks (beautiful coastal flowers that appear during spring here in Cornwall). This photo was taken on a very recent day trip in search of some waves to the South Coast of Cornwall, just a couple of miles from Lands End. It’s a protected area of outstanding natural beauty and bay enclosed by the Logan Rock headland has been listed amongst the ten most beautiful bays in the World! It’s has to be one of my favourite places in Cornwall. 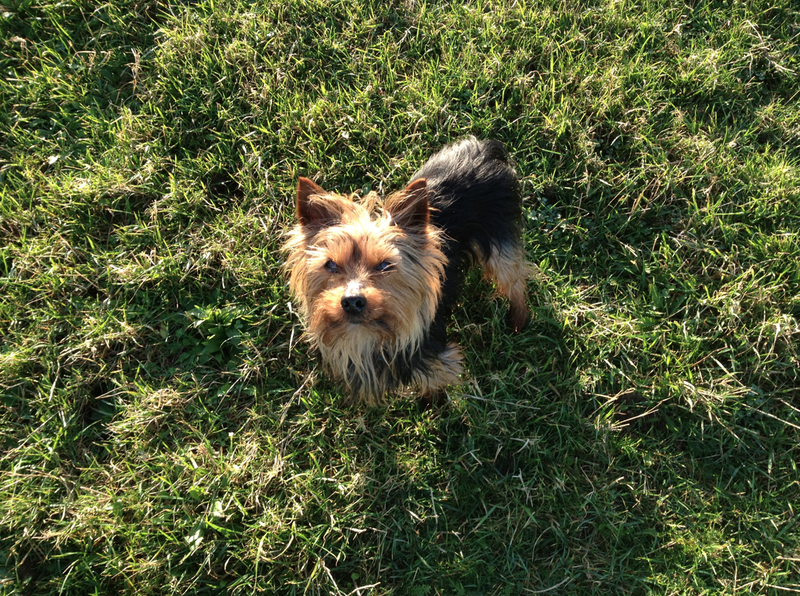 GREEN – This is my mums dog Scruffy. He is quite old now but still loves to potter around the garden for hours on end. Here he is doing his thing! YELLOW – Yellow is the colour of my surf school. We have bright yellow vests to help us identify our students when they’re in the water amongst the waves, and I love it when we can get everyone together for a photo opportunity on a bright sunny day. 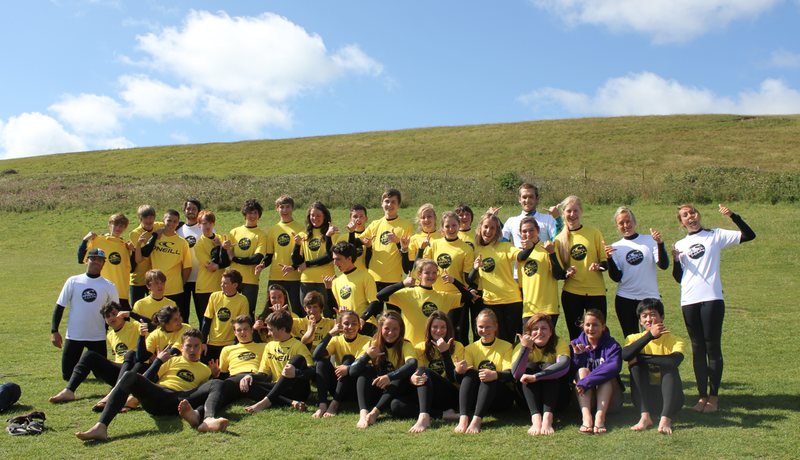 Here we have an amazing group of kids from the Latymer Upper School who were fortunate to come and join us for their surfing activity week. Most recently a little boy of about 7 years of age asked his mum if he could go to the ‘sunny surf school’ again… It transpired that he couldn’t remember the name of our surf school but could remember the colour of our sunny yellow vests….it just goes to show how colours can evoke memories and associations for even the youngest of children! WHITE – At first this may appear as a slightly odd image if you don’t know what it is. On first glance you may think it’s snow, but then you’ll probably spot that there are cliffs and fields! This is in fact my local beach during the winter a couple of years ago now. 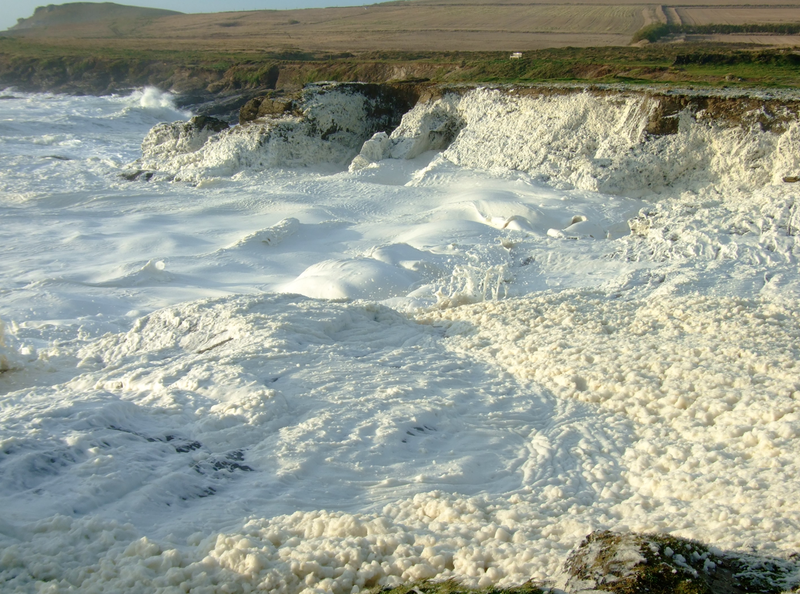 Its the first time I have ever seen quite so much sea foam! It was thick and deep after being whipped up by the ocean after a few days of stormy conditions at sea. I have never seen anything like this before or since. There was so much foam that the waves were silent which is very odd when you’re used to the sound of crashing waves as they hit the shoreline. A very eerie scene!!! I had actually forgotten that we’d filmed it too…you can see it HERE. It was hilarious watching people in awe of the foam, and those who got covered in it as it blew up the cliff face and across the footpaths. We saw more than one person slip over. It was like one mega outdoor foam party! RED – This has got to be one of my most favourite sunset pictures I’ve taken in a very long time. It was taken one evening during a bbq in the sand dunes of Vieux Boucau beach on the coastline of South West France during one of my Surf Affinity Girls Only Surf Camps. Kirsty who’s silhouette can be seen in the picture was one of my lovely students, and as I was snapping away trying to capture the best moments of the sunset she was heading out of the water after a long surf session. 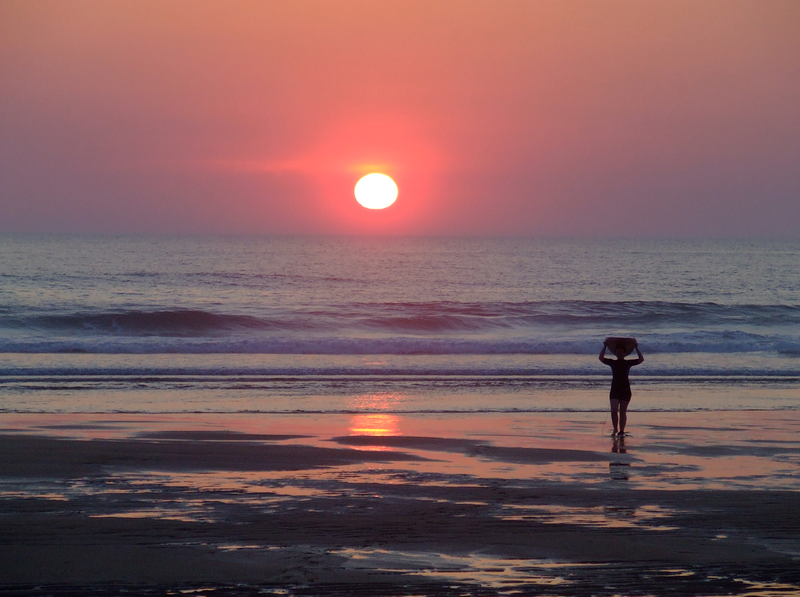 I think it captures the feeling of surfing at sunset and always makes me smile….I also gave Kirsty a copy of this picture as a momento of her surf trip, which she loved. This photo brings back lots of happy memories of long warm evenings on the beach with the smell of the pine forests and salty air. Take me back now!!!! Check out http://www.travelsupermarket.com/c/holidays/capture-the-colour/ for more details of the competition.